SRA Snapshots Video Science is a supplemental science program that motivates students in Grades 3-5 who struggle with understanding core science concepts and difficult science vocabulary! 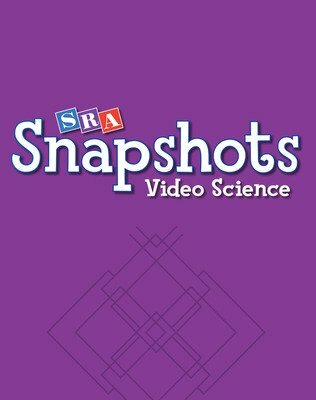 SRA Snapshots Video Science has a flexible and easy-to-use format that allows you to efficiently provide important reinforcement and testing practice of key science concepts found on state tests. With our exclusive SHR Science Learning Approach, no matter what the learning style, your students learn the basic science concepts and key vocabulary they need to be successful in today's science classroom and on high-stakes science tests. With SRA Snapshots Video Science, your students see science through our exclusive video lessons that are integrated with the student book providing today's visual students with a format they are accustomed to seeing every day. Through high energy narrators and Webster, The Vocabulary Spider, in the video lessons and video glossary your students hear science so that auditory learners get the main ideas and key vocabulary support they need for comprehension. Through the corresponding colorful softbound student book, your students read science that is written in a student-friendly manner that makes the main ideas and key vocabulary understandable even for the most struggling readers. The Teacher Resource Package includes everything needed to support your students' learning: Program DVDs, Student Edition (1 copy), Teacher's Guide, Teacher's Resource Book, Teacher Resource CD-ROMs, and a convenient carrying case.